Antibodies to GAD-65 have been implicated in the pathogenesis of type 1 diabetes , limbic encephalitis and Stiff person syndrome, however these diseases rarely occur concurrently. We intend to present a rare case of 35 year old female who was recently diagnosed as having type 1 diabetes presented with 1½ month history of recurrent seizures, subacute onset gait ataxia, dysathria, psychiatric disturbance and cognitive decline. No tumor was found on imaging and the classic paraneoplastic panel was negative. Cerebrospinal fluid and blood was positive for GAD-65 antibodies.Patient showed significant improvement with immunomodulatory therapy. Association of GAD-65 antibodies has been found with various disorders including type 1 diabetes, limbic encephalitis, Stiff person syndrome,cerebellar ataxia and palatal myoclonus.This case presents with unique combination of type 1 diabetes, Stiff person syndrome and limbic encephalitis associated with GAD-65 antibodies that is responsive to immunotherapy. It also highlights the emerging concept of autoimmunity in the causation of various disorders and there associations. Limbic encephalitis (LE) is a rare disorder affecting limbic system mainly medial temporal lobe. Initially it was considered to be only of paraneoplastic origin, but now autoimmune (nonparaneoplastic) etiology had been identified. Most common autoantibodies associated with LE are voltage-gated potassium channel (VGKC) antibodies, N-methyl-D-aspartate (NMDA) receptor antibodies, and glutamic acid decarboxylase (GAD) antibodies. LE was first described by Brierley et al., in 1960 when they reported three cases of subacute encephalitis involving limbic area. Term "limbic encephalitis" was coined by Corsellis et al., in 1968,  and he established the relationship between LE and systemic cancer. Clinically, diagnosis of LE poses a challenge because of nonspecificity of signs and symptoms. It can present with seizures, memory problems, and psychiatric disturbance. Such a clinical syndrome can be seen in wide variety of disorders including viral encephalitis, autoimmune disorders as Hashimoto's thyroiditis, Sjogren's syndrome, systemic lupus erythematosis, and central nervous system (CNS) vasculitis. Many neuronal antibodies have been associated with LE. These can be either directed against intracellular antigen, including Hu, CV2/CRMP5, Ma2, and antiamphiphysin that is associated with classic paraneoplastic syndrome which is only partially responsive to immunomodulatory therapy. The other group includes either antibody directed against cell membrane antigen, including VGKC and NMDA receptor or against intracellular enzyme GAD and it shows significant response to immunomodulatory therapy. Stiff person syndrome (SPS) is a rare autoimmune neurological disease that is characterized by rigidity, episodic spasm of musculature, and continuous motor activity. It was first described by Moersch and Woltman after a review of 14 patients over 27 years. SPS may be associated with autoimmune diseases such as type 1 diabetes mellitus and pernicious anemia. This disorder is thought to be the result of an immune-mediated deficiency of gamma-aminobutyric acid, a major inhibitory neurotransmitter in the CNS. The majority of patients of SPS have high titers of GAD-65 antibodies. Here we present a case of a 30-year-old female recently diagnosed diabetic presented with seizures, cognitive decline, psychiatric disturbance, rigidity, and cerebellar dysfunction and positive for GAD-65 antibody. This case shows classic but rare example of combination of autoimmune spectrum (LE, type 1 diabetes, and SPS) of disorders associated with GAD-65 antibodies. In addition to LE, SPS, and IDDM; other disorders described with GAD-65 antibodies are cerebellar ataxia with polyendocrine autoimmunity and epilepsy. Presence of cerebellar dysfunction in our patient points toward common etiology of spectrum of disorders associated with GAD-65 antibody. A case of 30-year-old, right-handed female who was recently diagnosed diabetic 3 months back presented with 1.5 month history of recurrent episodes of GTCS; cognitive decline in the form of decreased memory; behavioral changes in the form of apathy; and brief episodes of disorientation with ataxia, diplopia, slurring of speech, generalized rigidity, and spasm of limbs. Higher mental functions testing revealed cognitive decline in the form of loss of immediate and recent memory and cerebellar dysarthria. Cranial nerve examination showed slowing of saccades and broken pursuit and rest was normal. Motor system examination revealed generalized rigidity, power was 5/5 in all four limbs, deep tendon reflexes were normal, and plantars were bilaterally flexor. Sensory examination was normal and there were positive cerebellar signs on both sides with ataxic gait. Fasting, postprandial, and random blood sugar were found to be raised on several occasions. Magnetic resonance imaging (MRI) was suggestive of hyperintensities in bilateral medial temporal lobes [Figure 1] and electroencephalogram (EEG) done was showing slowing of background. Lumber puncture done was suggestive of normal cells, sugar, protein, and polymerase chain reaction (PCR) for herpes simplex virus (HSV) was negative. Contrast computed tomography (CT; thorax + abdomen) and mammography were normal and serological studies for various tumor markers were negative. Evaluation of typical antibodies (Hu, CV2/CRMP-5, Ma2, and antiamphiphysin) present in paraneoplastic panel was also found to be negative. Autoantibody markers in cerebrospinal fluid (CSF) and serum showed presence of GAD-65 antibody, but evaluation of NMDA receptor antibodies and VGKC antibody (CASPR2 and LGI1) was negative. Method used for autoantibody testing was indirect immunofluorescence test. Electromyography showed continuous motor unit activity in agonist and antagonist muscles. In view of above clinical syndrome and investigational findings, possibility of autoimmune LE with type 1 diabetes and SPS was considered. Patient was managed with intravenous immunoglobulin at total dose of 2 g/kg over 5 days, insulin, baclofen 10 mg, antiepileptics (levitracetam and clobazem), and other supportive medications. Patient was discharged on azathioprine (1.5 mg/kg/day) and rest treatment. At 3-month follow-up, patient showed significant improvement in cognitive status, rigidity, cerebellar signs and symptoms, and also requirement of insulin has been decreased. No fresh episode of seizure occurred during this period. LE typically presents with amnesia, behavioral disturbance, psychiatric symptoms, seizures, and altered consciousness. Although the etiology was historically considered as paraneoplastic, now it is well-known that it could result from autoimmune processes. Besides there are also case reports pertaining to noninfective, antibody negative LE. Clinical signs and symptoms are nonspecific and they can also be seen in other conditions such as viral infections, inflammatory or autoimmune disorder (lupus, Sjogren's, Hashimoto's encephalopathy, and vasculitis), and toxic and metabolic encephalopathies. This creates a diagnostic challenge to label a patient as LE. So other condition must be ruled out before diagnosing LE. One associated with antibodies to intracellular neuronal antigens including Hu, Ma2, CV2/CRMP5, and amphiphysin (classic paraneoplastic). One associated with either antibodies to cell membrane antigens, including VGKC and NMDA receptor or intracellular enzyme like GAD. SPS is a condition characterized by progressive muscle rigidity and stiffness with concurrent painful spasm of axial musculature and continuous motor activity. It affects females more than males and the age of onset is in 3 rd -6 th decade. Gamma-amino butyric acid (GABA) is an inhibitory neurotransmitter in brain and spinal cord. Impairment of GABAergic pathway with deficiency of brain GABA leads to continuous firing of spinal motor neuron, with resultant stiffness and spasms, which are the hallmark of SPS. It has been demonstrated that antibodies to GABA A receptor association protein (GABARAP) play role in SPS pathogenesis. Antibodies to GAD are excellent diagnostic marker in SPS and later linked to its pathogenesis. SPS is associated with autoimmune diseases as type 1 diabetes mellitus (60% of cases), (10) thyroiditis, vitiligo, myasthenia, adrenal insufficiency, and pernicious anemia. For treatment part, benzodiazepines and baclofen are considered as initial therapy for SPS. Corticosteroids, intravenous immunoglobulin are other therapeutic options. Here we found a case of 30-year-old female with LE in association with type 1 diabetes mellitus and SPS. In our patient, another finding was cerebellar ataxia and this might be another manifestation of GAD spectrum disorder. Treatment with diazepam, baclofen, intravenous immunoglobulin, insulin, and antiepileptic was given. Patient was then continued on azathioprine. At 3 months follow-up, we found significant improvement in cognitive status, decrease in rigidity, and ataxia. No fresh episode of seizure occurred during this period and her blood sugar level showed progressively decreasing requirement of insulin. LE is a rare disorder affecting mainly medial temporal lobe. Initially it was considered to be paraneoplastic, but autoimmune (nonparaneoplastic) cases have also been found. Anti-GAD antibodies have been described in many conditions in addition to autoimmune LE. Here we are presenting a case of autoimmune LE in association with type 1 diabetes mellitus and SPS along with cerebellar ataxia. Since it is therapeutically responsive, so timely diagnosing and proper intervention will prevent permanent neurologic damage. 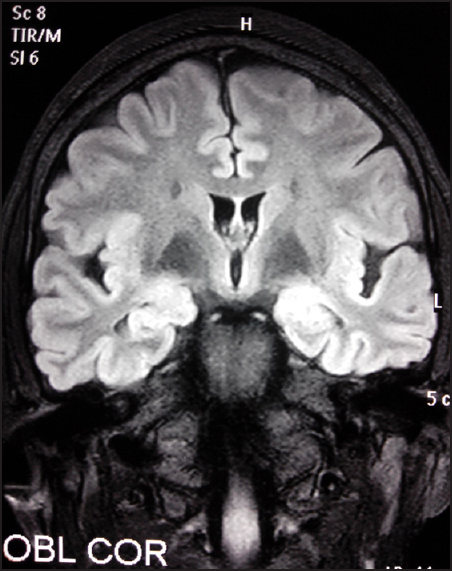 Brierley JB, Corsellis JA, Hierons R, Nevin S. Subacute encephalitis of later adult life. Mainly affecting the limbic areas. Brain 1960;83:357-68. Corsellis JA, Goldberg GJ, Norton AR. 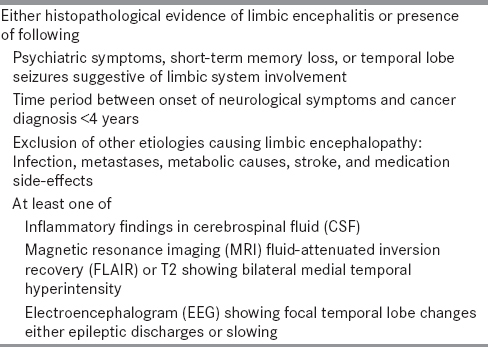 "Limbic encephalitis" and its association with carcinoma. Brain 1968;91:481-96. Christie M, Landin-Olsson M, Sundkvist G, Dahlquist G, Lernmark A, Baekkeskov S. Antibodies to a 64,000-/Wr islet cell protein in Swedish children with newly diagnosed type I (insulin-dependent) diabetes. Diabetologia 1988;31:597-602. Baekkeskov S, Aanstoot HJ, Christgau S, Reetz A, Solimena M, Cascalho M, et al. Identification of the 64K autoantigen in insulin-dependent diabetes as the GABAsynthesising enzyme glutamic acid decarboxylase. Nature 1990;347:151-6. Dalakas MC, Fujii M, Li M, McElroy B. The clinical spectrum of anti-GAD antibody-positive patients with stiff-person syndrome. Neurology 2000;55:1531-5. Ahmad SA, Archer HA, Rice CM, Gerhand S, Bradley M, Wilkins A. Seronegative limbic encephalitis: Case report, literature review and proposed algorithm. Pract Neurol 2011;11:355-61. Gultekin SH, Rosenfeld MR, Voltz R, Eichen J, Posner JB, Dalmau J. Paraneoplastic limbic encephalitis: Neurological symptoms, immunological findings and tumour association in 50 patients. Brain 2000;123 (Pt 7):1481-94. Graus F, Saiz A. Limbic encephalitis: A probably under-recognized syndrome. Neurologia 2005;20:24-30. Bataller L, Kleopa KA, Wu GF, Rossi JE, Rosenfeld MR, Dalmau J. Autoimmune limbic encephalitis in 39 patients: Immunophenotypes and outcomes. J Neurol Neurosurg Psychiatry 2007;78:381-5. Mata S, Muscas GC, Naldi I, Rosati E, Paladini S, Cruciatti B, et al. Non-paraneoplastic limbic encephalitis associated with anti-glutamic acid decarboxylase antibodies. J Neuroimmunol 2008;199 (1-2):155-9. Dalmau J, Gleichman AJ, Hughes EG, Rossi JE, Peng X, Lai M, et al. Anti-NMDA-receptor encephalitis: Case series and analysis of the effects of antibodies. Lancet Neurol 2008;7:1091-8. Mazzi G, Roia DD, Cruciatti B, Mata S, Catapano R. Plasma exchange for anti GAD associated non paraneoplastic limbic encephalitis. Transfus Apher Sci 2008;39:229-33. Saidha S, Murphy S, Ronayne A, McCarthy P, Hennessy MJ, Counihan T. Treatment of anti-glutamic acid decarboxylase antibody-associated limbic encephalitis with mycophenolate mofetil. J Neurol 2010;257:1035-8. Darnell RB, Victor J, Rubin M, Clouston P, Plum F. A novel antineuronal antibody in stiff-man syndrome. Neurology 1993;43:114-20.